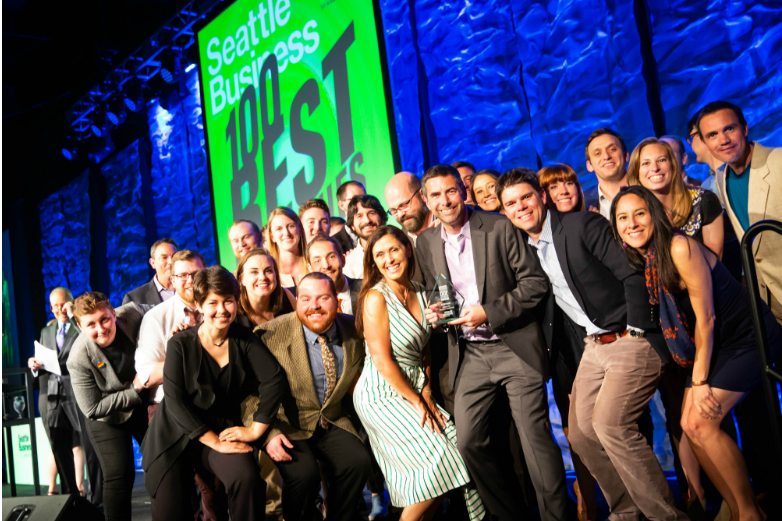 This article is part of a series focusing on select companies who placed among WA's 100 Best Companies to Work For in 2018, as determined by employee surveys that measure their perceptions and satisfaction across 82 individual attributes within 10 employment categories. Not only do employees feel connected to the bold vision of the 2-year old Seattle-based company (“SO cool!” stated one team member) but they are proud of the company’s drive to “provide peace of mind to their clients, along with the “Industry Best Residential Solar Protection Plan.” Omnidian is the industry’s only independent provider of technology-enabled, all-encompassing protection for investments in residential solar systems, with thousands of clients consisting of homeowners as well as owners of large-scale residential portfolios. As industry leaders, the Omnidian team reports it has managed nearly half of all residential solar systems ever deployed in the U.S. The same trust that Omnidian develops with customers begins with the leadership’s approach within the company and continues to compound as the company grows. “The leadership team is unlike any group that I have worked for -- they are industry veterans with zero ego. They are incredibly generous, with their time, energy, attention, and interest in us (associates),” affirmed one employee. Omnidian employees come to work not only because they believe in the company’s mission to help more people find, “the confidence to go solar without fear,” but also because they sincerely enjoy each other’s company. “Omnidian has done a great job of bringing in great people and the people make it a great place to work. Smart, capable, friendly...truly amazing team,” said an enthusiastic employee. A genuine concern from leadership for the wellbeing and success of employees is widely appreciated and permeates throughout the culture among coworkers, “The leadership of Omnidian has built an amazing company and is driving the success on their most valuable resource: their employees. I have never worked with such an amazing, kind and experienced team before,” stated a team member emphatically. Learn more about careers at Omnidian at omnidian.com and find out more about WA's 100 Best Companies to Work For in 2018.